We will now compare the cost of Medi-Share vs conventional health insurance across different ages, marital statuses, and family sizes. As discussed in our main Medi-Share review, the Annual Household Portion works like a deductible. The health discount is available to most families, with the only requirements being: A BMI between 17-30, a waist size below 38" for men and below 35" for women, as well as a blood pressure of less than or equal to 125/85. Of course, it's not easy to give an exact price comparison for different types of health insurance that will have different levels of coverage, deductibles, and other features. 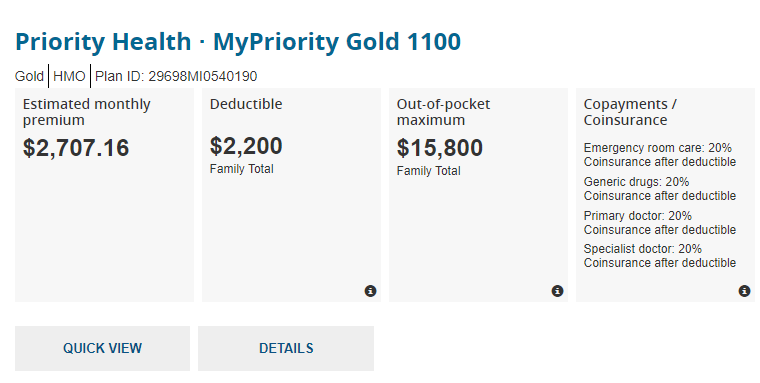 Nonetheless the numbers on this page offer a good basic comparison of the cost difference between normal health insurance and Medi-Share's Christian health insurance alternative. The quotes for conventional insurance all come directly from the official healthcare.gov site. They are the lower rates for non-smokers and come from four different states across the country. We'll finish with an estimate of actual Medi-Share savings combining all factors. 1. The copay for Medi-Share (called a provider payment) averages slightly higher than conventional insurance, at $35 for a doctor/hospital visit, and $135 for an emergency room visit. 2. Medi-Share does not cover all routine/planned medical expenses. 3. Monthly share payments are not tax-deductible. On the flip side, factors such as superior customer service and 24/7 online doctor appointments are significant benefits of Medi-Share in addition to the lower price. Medi-Share also negotiates a significant discount when you're paying before reaching your annual household portion (deductible). Combining all these factors, our estimate is that the average family will save around 60-65% each year with Medi-Share compared to conventional insurance. In terms of a dollar figure, this makes the annual savings through Medi-Share somewhere between $2000 and $12,000, with most families saving an average of around $5,000 per year. ​Our own savings as Medi-Share members have been substantial, saving approximately $4200 every single year relative to our previous health insurance. ﻿﻿﻿Click on the button below and fill out the short form to get your free information packet directly from Medi-Share. It is by far the best breakdown available of how much you'll pay each month for every option, exactly how the program works, and serves as a highly useful reference once you're a member. We would also be grateful as our family receives a referral payment if you decide to join after clicking below and filling out the short form. These payments allow us to maintain this site and make a monthly donation to Medi-Share's Extra Blessings program, helping families in need to pay their medical bills.